The Florida State Seminoles are the athletic teams representing Florida State University located in Tallahassee, Florida. They compete as a member of the National Collegiate Athletic Association (NCAA) Division I level ( Football Bowl Subdivision sub-level for football), primarily competing in the Atlantic Coast Conference (ACC) for all sports since the 1991–92 season; within the Atlantic Division in any sports split into a divisional format since the 2005–06 season. Florida State Athletics began in 1902 when the then Florida State College football teams played three seasons. The 1905 Buckman Act reorganized the existing seven Florida colleges into three institutions, segregated by race and gender. 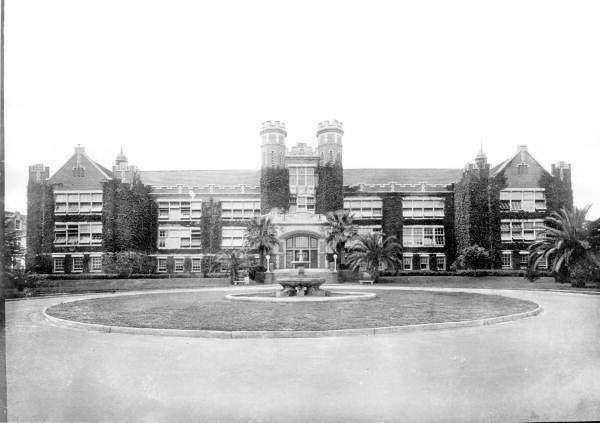 As a result of this reorganization, the coeducational Florida State College was renamed the Florida State College for Women. 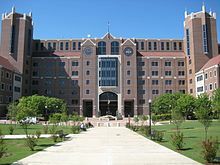 The Florida State University became a co-ed institution in 1947 with most of the newly enrolled male students back from service in World War II. The "Seminoles" name, chosen by students in a 1947 vote, alludes to Florida's Seminole people who in the early nineteenth century resisted efforts of the United States government to remove them from Florida. Since 1978 the teams have been represented by the symbols Osceola and Renegade. The symbol represents an actual historical figure, Seminole war leader Osceola, whose clothing represents appropriate period dress. The athletic logo, in use since the early 1970s, shows a profile of a shouting Seminole warrior in circle. The model for the logo was Florida State music faculty member Thomas Wright, composer of the Florida State University Fight Song and Victory Song. The use of names and images associated with Seminole history is officially sanctioned by the Seminole Tribe of Florida. Athletic programs resumed and Florida State fielded its first football team in 43 years with FSU facing Stetson on October 18, 1947. Florida State recently[ when?] developed a rivalry with their Atlantic Division foe Clemson. Florida State leads the all-time series 20–12. In addition to their in-state rivals, Florida State enjoys baseball rivalries, primarily with Georgia Tech. Florida State University sponsors teams in nine men's and eleven women's NCAA sanctioned sports. Florida State competes as a member of the Coastal Collegiate Sports Association in beach volleyball. Under the command of Head Coach No. 11 Mike Martin ( FSU 1966), Florida State is the second-winningest program in the history of college baseball. Since 1990, FSU has had more 50 win seasons, headed to more NCAA Tournaments and finished in the top 10 more than any other team in the country. Since 2000, FSU is the winningest program in college baseball with more victories and a higher winning percentage in the regular season than any other school. Despite their success, Florida State is still chasing their first CWS Championship. Under head coach Bobby Bowden, the football team became one of the nation's most competitive football teams, greatly expanding the tradition of football at Florida State. The Seminoles played in five national championship games between 1993 and 2001, and have claimed the championship three times, in 1993, 1999, and 2013. The FSU football team was the most successful team in college football during the 1990s, boasting an 89% winning percentage. FSU also set an NCAA record for most consecutive Top 5 finishes in the AP football poll – receiving placement fourteen years in a row, from 1987 to 2000. The Seminoles were the first college football team in history to go wire-to-wire (ranked first place from preseason to postseason) since the AP began releasing preseason rankings in 1936. FSU also owns the record for most consecutive bowl game victories with 11 between 1985 and 1996 and made a post-season appearance for thirty-six straight seasons from 1982-2017. The Seminole football team has also won eighteen conference championships in the Dixie and Atlantic Coast. The softball team plays at the Seminole Softball Complex; the field is named for JoAnne Graf, the winningest coach in softball history. Following the program's 25th 40-win season in 2006, Graf's 1,355 total wins are 149 ahead of the next closest coach. An 8–1 victory over Jacksonville on February 22, 2006, made her only the second coach in NCAA history to record 1,100 NCAA fast-pitch wins. In 1999, Florida State received a state-of-the-art softball complex, which also houses the soccer stadium. The Florida State Rugby Football Club was founded in 1970 , and plays Division 1 college rugby in the South Independent Rugby Conference. The Seminoles won the conference championship in 2012, defeating the University of Central Florida. With this conference championship, FSU qualified for the national playoffs and finished the spring 2012 regular season ranked 22nd in the country. In the national playoffs, Florida State defeated in-state rivals Florida 34-12 in the Sweet 16, before losing to Tennessee 45-27 in the quarterfinals. FSU is led by head coach Michael Gomez. The athletic department emerged in January 2010 from NCAA sanctions resulting from the discovery of academic cheating by athletes in 2006–2007. This discovery involved athletes in ten sports programs who were taking an online course in music history. An NCAA investigation resulted in scholarship limits and negation of wins involving compromised athletes. Florida State appealed parts of the decision. The penalties removed fourteen football wins from the career total of Seminoles football coach Bobby Bowden, yet the coach temporarily claimed the all-time record for Division 1 football wins in 2012 when a far larger number of victories was deducted from the career total of Pennsylvania State University football coach Joe Paterno. Paterno's wins were later reinstated, however, following an appeal from the Penn State Board of Trustees in January 2015.,  leaving Coach Bowden with the 2nd all-time winningest record in Division 1 football.